2016 was an amazing year full of surprises in the digital ads industry. For the first half of the year, according to a comprehensive survey conducted by a Taiwan-based Digital Marketing Association (DMA), digital ads spends statistically surpassed traditional TV ads expenses for the first time in Taiwan, hitting the history record and becoming the top ads display channel in terms of ads expenses. In the past few decades, traditional TV ads have predominantly dominated the marketing budget across almost every industry and have been the major channel to reach prospects. The surprising and overwhelming news of displacement struck the traditional media industry fundamentally, signifying the rapid advent of a new digital era. Traditional TV ads nowadays are increasingly notorious for the unspecific targeting methods and, especially in Taiwan, the unsatisfying and absurd TV series content. The ineffectiveness forces ventures to search for more productive solutions and, meanwhile, the low-quality content makes people turn to online content and seldom watching TV. With that said, the recession in traditional TV ads spends, plummeted by 12.5 % compared to last year’s statistics according to Nielsen Holdings PLC, comes as no surprise for some in the digital ad scenes. More precisely, the phenomenon is associated with the unusual affinity for mobile devices and social media. Take Facebook and smartphones for example. Taiwan has the highest Facebook penetration rate and nearly 95% of Taiwanese use Facebook, which obviously makes it a comparatively better channel to display ads. Accordingly, Taiwan has the highest smartphone user penetration of any country according to eMarketer’s search —73.4% of Taiwan's population use smartphones. From the astonishing statistics alone, Taiwan, undoubtedly, has become one of the leading “mobile social” countries in the world. The shift of the audience’s eye movement determines where marketers’ resource goes. Inevitably, the aforementioned results encourage marketers to allocate a relatively big amount of advertising budget to these two fields, social media, and mobile ads. They account for 31.2% and 68.5% of total digital ads spend, respectively, and are expected to keep growing in the following years. To be fair, digital ads spend flowing to video ads, which takes up 19.4% of the overall expenditure and is ranked third place followed by social media and display ads, actually shifts mainly from the displacement of traditional TV media. On top of that, the rising audience’s favor for video type content is also one of the defining factors leading to the growth of digital ads. Until now, the ad spends on videos is growing at an unprecedented pace, outpacing any other ad types. The rise of programmatic media buying, on the other hand, excites digital ads advocates as well. In DMA’s Annual Digital Ads Report 2016, programmatic buying accumulatively accounts for 26% of overall digital ad spend, showing a strong potential and momentum to rapidly dominate digital display markets in the future. Notably, the growth does not solely suggest the increase in figures nominally. In contrast, it implies the rising popularity and developing trustability toward the audience-centric advertising techniques enabling both advertiser and publisher to more efficiently buy and sell their favorable and desirable placements. What is more, with Google and Facebook sparing no effort in launching and updating new products, such as dynamic product ads, to optimize ads performance, the entry barrier to managing ads campaign is becoming relatively lower. More and more ventures and e-commerce alike are believed to embrace programmatic buying soon in Taiwan. Despite the fact that digital ads industry seems flourishing and progressing, there, in fact, exists a series of challenges awaiting for overcoming, one of them being post-campaign management. As reported by insightXplorer, a market research consulting company based in Taiwan, nearly 50% of Taiwanese surveyees would do online research for the ads right after the content and information were exposed to them. The findings actually indicate advertisers should not only focus on the metrics in ads display results but also put comprehensive effort to create worth-staying navigation environment after audience clicks on ads. More explicitly, a complete ad campaign never ends until the audience becomes loyal customers. That being said, most Taiwanese advertiser do not manage the post-campaign well, making conversion rate remain stagnant. Another challenge worth noting is the increasingly widespread adoption of intrusive standalone interstitial and intrusive pop-up on digital mobile ads in Taiwan. This type of ad mostly compels website visitors to engage with ads that the close button is intentionally hidden and, most importantly, makes the website content inaccessible by covering almost the entire screen, greatly disrupting visitor experience. In fact, a few famous online portals and popular publishers are commonly observed to use intrusive standalone interstitial and are frequently reported to destroy the interfere with website navigation. Worse still, some with evil intentions direct visitors to an irrelevant website compulsorily by faking the close button when visitors try to dismiss. A majority of audience members all expressed these types of ads made them feel they were one more step away from the content they were looking for. Such feelings may deteriorate more if the ad content is not appealing and not what they are interested in. Some even launched a Facebook event to repeal the torrent of adopting intrusive standalone interstitial and intrusive pop-up. Needless to say, the above-mentioned cases which are unfriendly and extortionate are obviously shortsighted and deceptive. Thankfully, as Google confirmed rolling out the mobile intrusive interstitials penalty by lowering website rankings earlier in January, the foregoing situation may greatly alleviated and are anticipated to enforce websites manager to eliminate the use of those ad types eventually. Located in the transitional territory between the developed countries, the U. S. and Japan, for example, and Southeast Asia, Taiwan’s strategic position is extremely paramount in terms of business expansion. As far as startups and ventures from the developed countries are concerned, taking Taiwan as a cornerstone to consolidate essential resources for expanding to Southeast Asia is a perfect idea because of desirable market size and high disposable income. Likewise, Southeast Asian startups can regard Taiwan as a field-testing site before boldly entering bigger and more mature markets due to Taiwan’s great similarity and tendency in industry progression with developed countries. The ups and downs in the Ad industry, to some extents, represent the current performance of entire industries. As digital ads growth continues showing no sign of slowing, digital-related industries, e-commerce, for example, inarguably will manifest a similar growing pattern, becoming the mainstream industry of the future. Indisputably. 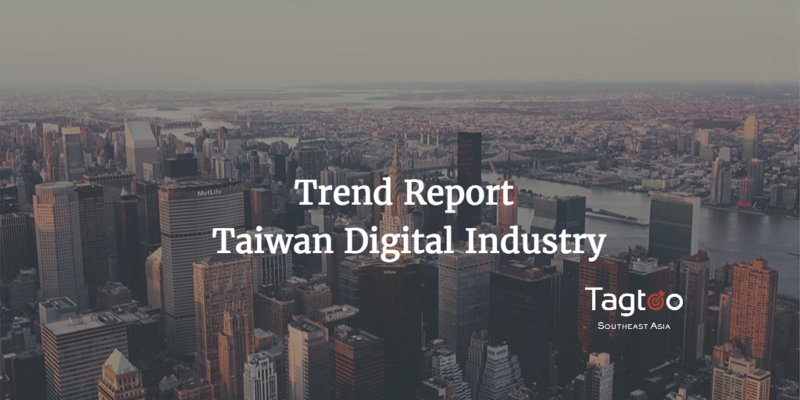 having a deep understanding of Taiwan’s digital ads industry will be the key to gaining a foothold in Asia and determine the final remaining winners in the fierce competition.